Just when we all thought Qualcomm had made all of its Mobile World Congress 2018 announcements last week, the company pulled a few more rabbits out of its hat today, this time, related to full 5G turnkey digital, analog, and processor modules and even more RF expansion. While the digital 4G LTE and 5G modems get most of the attention, it takes hundreds more analog parts, or the RF (radio frequency), plus antennas to make a full wireless solution. Here is a quick tutorial I use to explain RF to people. Qualcomm is the undisputed market share leader on the digital modem side and has recently launched an RF market attack with a shock and awe approach, likely negatively impacting Broadcom Limited, Qorvo Inc, and Skyworks Solutions Inc. Qualcomm announced numerous, large, customer RF commits at CES 2018 (Samsung Electronics, Sony, HTC, LG, and Google), in China (Lenovo, OPPO, Vivo, and Xiaomi), and with today’s announcements, raises the bar yet again with more vertical and horizontal integration and customer announcements. Let’s dive into the announcements. It takes thousands of parts to pull together a quality wireless device (smartphone, tablet, Connected PC, IoT, automotive) and with the multitude of new technologies and increasing complexity in 5G, it will get even harder to manage the bands, frequencies, and smarts required to make tomorrow’s sleek mobile industrial designs work. Qualcomm announced today that it was taking those thousands of parts and releasing a fully tested and optimized module whereby phone or other device-makers (car, Connected PC, tablet, hotspot) can more easily and quickly develop their own 5G products. Qualcomm is not saying exactly how many sub-modules come with the package, but I am guessing four or five. 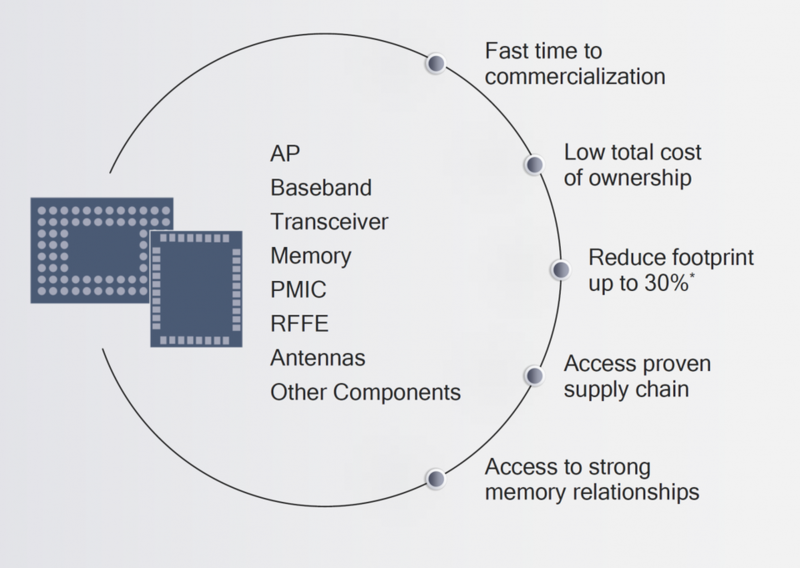 These four or five sub-modules that comprise the full, pre-optimized solution will include the digital baseband (cellular and other connectivity), 5G analog RF, other front-end functions, and mobile compute processing. Specifically, the full solution would include the AP (application processor), cellular, Wi-Fi and Bluetooth baseband processing (modem), memory, power management integrated circuit (PMIC), RF Front-End (RFFE), antennas and passive components. The customer alternative is to design and develop those thousands of components into a solution. This is classic “platformization” and vertical integration at work. The desired net result is that the smartphone or IoT device maker needs to spend less time designing, developing, testing and optimizing their wireless solutions, resulting in faster time to market, lower R&D costs, better/more uniform product quality and performance, and a greater diversity of devices. I remember the old PC days when there were separate CPUs, graphics cards, northbridge chipset, south bridge chipset, discrete L2 cache memory, network cards, and a separate floating-point chip? Not anymore- things change. Qualcomm says the 5G module could also result in a 30% footprint reduction, which makes total sense given the integration, and the company expects module availability in 2019. The biggest threat from this move will likely be discrete RF component providers like Broadcom, Qorvo, and Skyworks Solutions who only develop one part of the solution. The biggest winners here will be Chinese OEMs who do not need nearly as much time, effort and R&D to design and create a product with 5G, whether it be a smartphone, tablet, Connected PC, hotspot, connected car, or any of a thousand kinds of IIoT products. “Carrier aggregation” (CA) is an important feature used today in 4G LTE smartphones and in the upcoming 5G standard to increase data rates by combining data channels together. You can learn more about CA here. CA allows a wireless device, like a smartphone, to “multiplex’ or concurrently use several channels at different frequencies (e.g. 800Mhz., 2.5 GHz) to achieve increased data rates. You may be familiar with “4xCA” which is required to hit 1Gbps download speeds or the most recent Cat18 1.2Gbps download speeds that requires “5xCA”. I do not plan on getting into the nitty-gritty tech details on what a hexaplexer is, but CA requires different bands, and a hexaplexer simultaneously supports sending and receiving signals over three bands and seamlessly separates out the different bands received from the network to enable higher data rates and longer battery life. To enable carrier aggregation across diverse frequency bands optimally, different filter technologies that are used in combination with a hexaplexer solution. Qualcomm’s hexaplexer incorporates what is called bulk acoustic wave (BAW) and surface acoustic wave (SAW) filter technologies. These technologies provide increasingly high-performance at different frequency bands and are narrowing the gap with Broadcom’s FBAR filter technology. I believe that by supporting both BAW and SAW technologies, Qualcomm can meet more diverse carrier aggregation combinations, a requirement with gigabit 4G LTE and increasingly with 5G as operators want to utilize all their spectrum investments to drive higher quality streaming and mobile internet experience. Like the 5G modules, Qualcomm’s new front end hexaplexer could result in much faster time to market by reducing the complexity of band-rich handset designs. Qualcomm says the new hexaplexer solution will commence production this year with devices in 2019. Tuesday at Mobile World Congress, Qualcomm used the term “modem to antenna solution,” essentially calling out a complete digital and analog solution. Qualcomm is the only company who can do this kind of “horizontal” integration as neither Broadcom Limited, Qorvo Inc, nor Skyworks Solutions Inc. have the digital side. The end to end solution includes the complete digital LTE modem, WiFi, and Bluetooth plus all of the analog RF capability to support it. 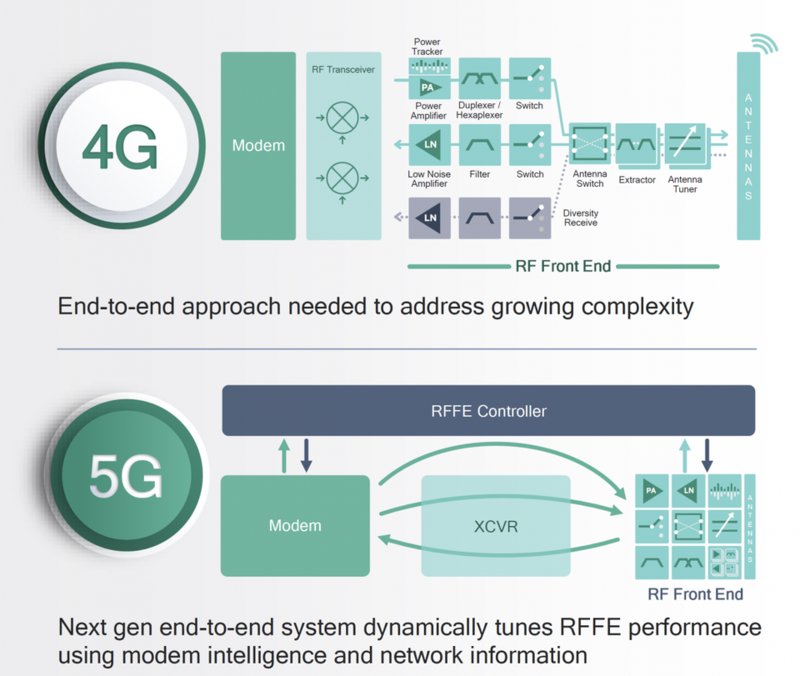 While modems like the Snapdragon X24 and X50 get all the glory, they require a host of RFFE technologies including power amps, and duplexers, envelope trackers, impedance tuners, and diversity receive modules. Today, as you can see from teardowns, many RFEE piece parts come from companies like Broadcom, Qorvo, and Skyworks. Qualcomm today announced a few of these first “modem to antenna” wins at Mobile World Congress. The company announced a complete RFFE solution win on the Sony Xperia XZ2 smartphone and Qualcomm announced it won at ASUS the full digital and analog stack for “upcoming premium smartphones” and Always Connected PCs. As we have seen with Qualcomm’s vertical and horizontal integration plays, “modem to antenna” can speed up time to market, decreases the amount of resources required to complete a wireless solution, and will likely result in a more energy efficient and performant device. It also threatens those companies who cannot supply the digital side of the equation. With all this technical jargon thrown around, why does any of this matter? Historically, Qualcomm was best known for its prowess on the digital LTE modem side while companies like Broadcom Limited, Qorvo Inc and Skyworks Solutions Inc. picked up the analog RF side. What started with a few Qualcomm analog piece-parts then turned into the full-blown TDK relationship and investment which put all these gears into motion. We now have a Qualcomm with a full “modem to antenna” stack, potentially displacing some RF solutions from Broadcom, Qorvo, and Skyworks in the smartphone. It would be one thing if Qualcomm were announcing RF solutions and no one came to the party. Well, several important OEMs showed up and the list is growing. At CES 2018, Samsung, Sony, HTC, LG and Google Pixel showed up and committed. At the end of January, China showed up to the Qualcomm RF party- Lenovo, OPPO, Vivo, and Xiaomi signed memorandums of understanding (MoU) with Qualcomm for RF chips. We can add ASUS to the list here with today’s announcement. For 5G, Qualcomm is expanding capabilities a notch up with an even more complete, modular 5G solution approach- everything an OEM would need to deliver a power-, performance-, and potentially cost-optimized solution. I can now understand more than ever why Broadcom would want to acquire Qualcomm. 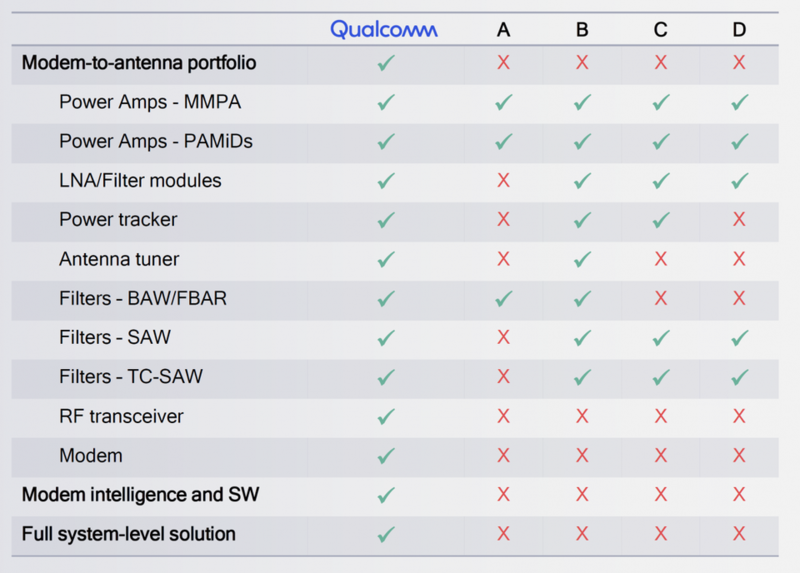 Broadcom missed the 4G LTE and 5G digital boats, underestimated Qualcomm’s RF design and execution, and now sees big RF competition from Qualcomm with several big customer wins. And lest we forget Wi-Fi market share, which Qualcomm is taking with its unique consumer mesh network solutions. I cannot even imagine how regulators would deal with this. Ask yourself this question- does a Qualcomm-Broadcom merger mean more or less RF, WiFi, and Bluetooth competition and choice for OEMs? I think you know the answer.